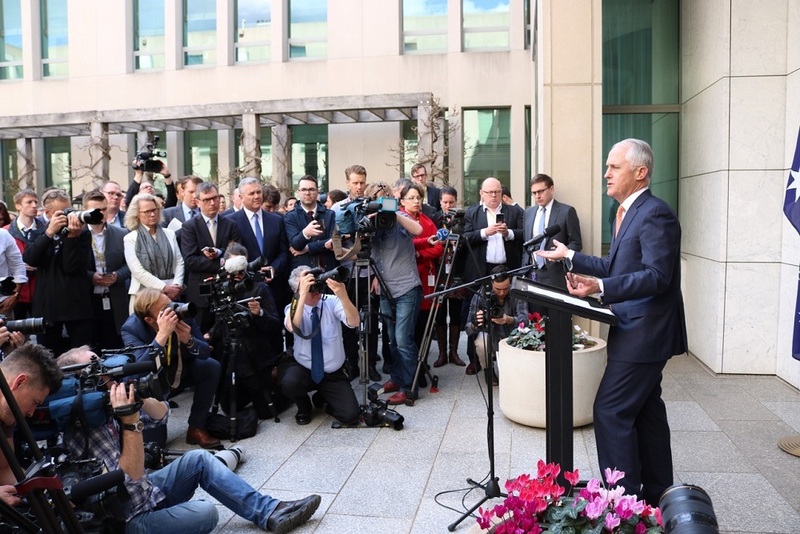 28 August 2018: Elle Conway knew that her University of Canberra Press Gallery internship would be exciting – but nothing could have prepared her for the up-close-and-personal view of history being made during the Liberal Party leadership spill last week. The final year Bachelor of Communications in Journalism student was in the second week of her internship. She had already spent a week producing stories with the Australian Associated Press. Last Monday, she walked into the Australian Broadcasting Corporation (ABC) newsroom and her world changed. The week began with the rumblings of Peter Dutton’s challenge and ended with a new Australian Prime Minister with Scott Morrison ousting Malcolm Turnbull. Throughout, Ms Conway was in the thick of it, shadowing and assisting ABC’s political reporters as they navigated the maze-like corridors of power. When she got back to the office, ABC News’ federal election producer Gillian Bradford was briefing staff who would cover the events unfolding at a breakneck pace. “She said to watch the smallest of details – who was walking with whom, who was coming out of whose office, how they all looked. Because we never knew when something might turn out to be significant. “It was amazing how they could put a situation together from all these cues, it was like building a puzzle. That’s why the journos tweeted anything and everything they saw so urgently, someone watching carefully could see the meaning in it. On Tuesday, Ms Conway was shadowing ABC’s political reporter Matthew Doran. “By the afternoon, people were trying to find out who had backed whom,” she said. “Matthew was at the main entrance and Malcolm Turnbull, Scott Morrison and Julie Bishop left through there. These movements helped reporters understand what was happening in the different camps. One of the things that struck Ms Conway was how fast things could change on the political front. “On Wednesday, there was a press conference with Turnbull, Morrison and Matthias Cormann, and Morrison put his arm around Turnbull and said, ‘This is my leader’. “The next day, Morrison put himself forward for the leadership,” she said. Ms Conway also remembers Turnbull’s farewell speech as an unexpectedly emotional one. Ms Conway still has another week of her internship to go, this time with Seven News. But she’s already gained huge insights into real-world journalism, watching how journalists work their sources, and seek to proactively cover even the fastest-changing subjects. Journalism has always been on Ms Conway’s horizons. It’s the intersection of her deep love for writing and a wanderlust that saw her take four years off after high school to travel around the UK, Europe and Central America. But where she initially saw herself as a foreign correspondent, or writing technology and human-interest stories, the week she’s just had now has her seriously considering a career in political journalism. “Being caught up in the thick of things, you develop a taste for it,” she said. “I really enjoyed learning about the investigative side of things, seeing how the journalists interacted with their sources. I liked the on-the-spot nature of it all, but also the deeper analysis that you can do.